A new book takes readers on a tour of a Philadelphia they've likely never seen before. The co-founders of Hidden City Philadelphia, an online publication that covers planning, architecture, preservation and more, recently released "Philadelphia: Finding the Hidden City." 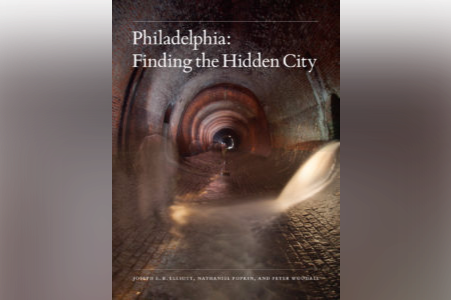 Published through Temple University Press, authors Peter Woodall and Nathaniel Popkin "explore secret places in familiar locations, such as the Metropolitan Opera House on North Broad Street, the Divine Lorraine Hotel, Reading Railroad, Disston Saw Works in Tacony, and mysterious parts of City Hall." "Much of the real Philadelphia is concealed behind facades," a press release from Temple read. "'Philadelphia' artfully reveals its urban secrets. Rather than a nostalgic elegy to loss and urban decline, 'Philadelphia' exposes the city's vivid layers and living ruins." Woodall and Popkin, along with photographer Joseph E. B. Elliott, try to tackle the question of what makes Philadelphia unique in comparison to other American cities – specifically, what makes it the "Hidden City." Elliott's 110 photos capture 33 places throughout the city, "including some hidden in plain sight." The book is available to buy for $40. A list of upcoming book signings and readings can be found here.